Eric Christopher is an innovative business consultant and media expert who helps business owners position themselves as authority figures and assists them in gaining exposure through major media channels. Throughout this episode, Eric brings up some key questions every business owner should ask themselves about what the ultimate endgame is for your business and what the end game is for your membership site. Eric shares his advice on how you can better position yourself and your brand as a respected authority figure for the long term that matches up with the goals and core values that you have for your business. As a membership site owner, want to learn how to get attention of journalists and learn how to develop those relationships so you can get featured in major media outlets? Eric is offering a free module from his membership site called “Free Media & Publicity Tips” that will help show you how you can go about getting major media exposure for yourself and your membership site. Eric ‘ERock’ Christopher is the founder and CEO of BizFamous, a consulting agency that promotes large brands and enterprises, and Local Business Rockstar, a company that empowers small businesses in their markets. ERock is driven by his mission to help entrepreneurs attract the right audience, build authority, and generate revenue. Before devoting his work fulltime as a business consultant, he served as a strength and conditioning coach to amateur athletes and Olympic gold medalists. He pursued his passion for the media industry after the success of his part-time marketing business. A media expert who has worked with world-renowned brands, ERock is also a featured columnist for HuffingtonPost.com, Entrepreneur.com, Business.com, Newswire.net, and SocialNewsViews.com. He has helped thousands of entrepreneurs get exceptional ROI through his creative branding and marketing strategies. If you are looking to grow a large community, it may be beneficial to build a brand where other people can get behind the brand instead of one particular individual. It’s one thing to get someone’s attention, it’s another to engage a person and maintain that engagement. It comes back to relationships. Focus on developing the right relationships with the right people rather than focus on what you want. If you provide value, the right people will want to work with you. Know your avatar and have done your keyword research. Do things in an authentic way that is relatable. People don’t care what you say about yourself. They care what other people are saying about you. Ultimately, you want brand ambassadors that will do this for you. Free Media and Publicity Tips from Eric - Eric is offering a free module from his membership site called “Free Media & Publicity Tips” that will help show you how you can go about getting major media exposure for yourself and your membership site. Text Memberium21 to 21777 to get the Free Module. https://www.entrepreneur.com/author/eric-christopher – Eric is a contributing author to this website. You can check out his published articles and learn more through this link. Micah: Hey everybody, it’s Micah Mitchell with the Membership Site Success Show and today we get to talk to with Eric Christopher, some of you may know him as Erock, I know him as Erock and he runs BizFamous and Eric has agreed to share some insight about positioning yourself as an expert and share as much marketing wisdom as we can go over in our time today so it should be fun, Eric thank you so much for joining us. Eric: I’m honored Micah, thank you for inviting me to your program and for anybody that’s listening to this, I’ve known Micah for quite a long time and he is an amazing expert in his own right and doing some great things in business and marketing so thanks for having me here. Micah: Yeah, of course, thank you I appreciate that. Erock, it’s funny because I came across you or maybe you reached out to us but it was right when we were starting Memberium, you were one of the first people who came on and helped to promote us and it’s interesting because and I bring this up because it kind of ties in, it seems like you did very little to promote us in the early days but it had legs, it worked for a long time and it had a big long tail, and so I see you as just a general marketing expert. I think you’re great at branding, I think you’re great at helping people really position as experts but before we dive into some of that, do you want to give us a little bit of history about yourself and your company, what you’ve done and what you’re doing now? Eric: Yeah, I promised to keep this extremely short because ultimately what people care about is how we can hopefully help them in this program. So it all started in a tiny little village in Austria back in 1971 where, so I’m totally kidding… The short story is, I went to college, I dropped out, I worked in a food service industry for many years, finally got tired of the day to day struggle, had tons of fun and great experiences, said I’m finally going to get serious about life, went back to school, got a 4.0 degree, a degree that I never use, went into a lot of student loan debt. But I went out and started a business, I was a strain coach and I trained folks from average folks all the way to people who helped trained Olympic athletes, professional athletes, things of that nature. So, I did very well at that point of my life and ultimately I went out of business because I didn’t know how to market myself. I started doing some marketing on a part-time basis, actually doing network marketing. A lot of people have that stigma about network marketing but it worked really well for us. We were with a company called Legal Shield that offers attorney services and it’s been an amazing service, any small business owner out there, you should be using it because it’s an unbelievable program. We became very successful, made a full-time income, generated hundreds of thousands of dollars in that industry, did it completely offline and then we decided to, I started messing around with some Google stuff and some online marketing. Ultimately, we had some success with that. I actually still get phone calls to this day from what you’ve talked about earlier, the introduction about long tail. We had some legs from that, people found out and they were asking what are you doing, how are you doing this and so we actually started helping some small business owners, started a company called Local Business Rockstar, that was a service for local business owners, but we’re working on a community program using Memberium to help service that community with some coaching and education with our academy and then we started getting referrals and we started getting referrals outside the local space, the national organizations and brands, started to get involved in the media through some connections that I had. Ultimately, we launched a brand called BizFamous and so now we focus on a lot of neuro marketing, positioning, Media placements, social PR, and we also have a social lead generation software that we’re in the process of developing right now as well. Micah: Got you, this is where to me you’re different than a lot of marketers because they will come in and say “Oh, I’ll build you a little funnel or I’ll write some email” or whatever but I feel like you approach it from a higher level. So let’s talk about that for a second, if somebody is starting a membership site, let’s say they’re and expert at some type of subject matter and they came to you, let’s just say that it’s the scenario where they got a bunch of money and they just want to get known as quickly as possible. I’m just kind of making this up, sorry to throw this curve ball at you, but what would you go and do, meaning you could say let’s just drive a bunch of ads or there’s press releases, there’s different ways to get known but assuming somebody has a membership site and at least a decent funnel, what would be your approach at getting them exposure and positioning them pretty quickly? There’s a lot of people who can just basically come out and establish themselves as social experts or experts in any industry. The key thing is what makes you unique, what makes you different and then how can we find ways to communicate that by sharing your story and then getting that featured on different entities or sites or areas where you’re conferring third part social status for your business. That’s what we really focus on, what’s the strategy, what’s your story, what makes you unique and then how do we communicate that story effectively so other people will want to share that story hopefully with their communities and into the public. Micah: So, it’s interesting, that whole explanation to me because you didn’t talk about what’s your product. That was really all about the person, the personality right? Eric: Yeah and I’m really grateful that you mention these high level things. I look at everything when we consult with anybody. Like, what would I do if I’m the CEO of your company? I never focus on how much can we make, it’s an interesting question and this is one of the things I’m sharing with your audience, if you’re doing any kind of consulting or services, a lot of times people come to us and be like “Hey we want to do this, we want to be that” and the first thing that we talk about is “Well tell me what’s your end game? Like why are you doing this, what do you want to have happen in five or ten years? What do you really want to do with your life? And so we instantly, when we get to that conversation, and I care, my goal isn’t to help you make x or 10x your business because everyone kind of talks about 10xing your business. I’m talking about how do you actually accomplish the reasons why you’re in business because my goal is to help you get there even if it means you don’t work with us. I want what’s best for you and I’ll always do that. So, we try to take a really holistic look at the business, Micah, and figure out how can we reach those objectives and kind of lay out the blue print on how you’re going to get there. Micah: Got you, yeah, it’s a lot more strategic than “hey I need help marketing”, “okay, what’s your lead magnet? Let’s change this headline or whatever”, it starts a little further up, it’s pretty cool. Sorry, as I was looking around I was readjusting my screen here so don’t worry about that, so let’s kind of go a level deeper. Let’s say that you’re helping somebody to market and they do have a cool unique story, how do you choose what channels to go into? Let’s come up with an example. Let’s say somebody is an attorney in Arizona, you live down there in Arizona, so what is it that you’re looking for, is it a bunch of super local channels or how do you go about it? Eric: We don’t necessarily go after media right away. What we’re looking to do is be able to find outside external media. One of the things we want to do when consulting with you is that we’ve very videocentric. We actually have a unique program that we call *inaudible* Story System (8:55) and it’s not even publicly available, it’s something that we only do by invitation only. It’s a very videocentric platform where we focus on how can we create authentic content, videocentric content for your business that can help you effectively share your story, that you can communicate what it is about you that makes you different. One of the things that we do talk about when we do consulting clients is tell us your core values. Some people may know or may not know I’m a contributor to entrepreneur.com and some other sites like Huffington Post and News Wire and Business.com so one of my favorite articles I get tons of feedback on is an article about core values. When we’re consulting with businesses we want to know what are your values because we don’t want to be transactional, we want to focus on being relational. We hope to have partnerships on a long-term basis. One of my favorite stories is our very first ever client was with us for six years when I first started my first company until they actually sold their business and I take a lot of pride in that because we really helped them get where they want to go. Again, it’s how do you effectively share your story using video because to me, if any of your listeners or viewers are soaking this in is they’re going to be taking advantage of the video trend, it’s going to be happening over the next half decade and beyond in terms of positioning themselves. Micah: Got you, and I’m going to jump around a little bit here but I’m just trying to pick up the pieces, I mean extract what I can from you. So, we’re talking about the person or personality. How do you think about or how should people think about their personality and their brand? How much are those two the same, how do you maybe transfer the person’s fame and how well people know them onto the brand, should you, when maybe should you? So, talk about personality, you know, person versus the brand. Eric: That’s a great question. This goes back to us eating our own dog food if you will. We’re working right now on my wife’s second book and helping her. She coauthored an anthology book for Jack Canfield a couple years ago and now she’s working on her second book and we talk about do we want to brand her as July Christopher or do we want to brand her company BizTuition and how do we want to do that. To me that’s a unique situation for every person and it really comes down to that person as an influencer or as an executive. What really matters to them, again going back to these core values, is what’s your ultimate objective. If your goal is to create some type of evergreen legacy type of business, you want that to last beyond just your existence here, then you want to go generational, my suggestion is to focus on building the brand because if we talk from a BizFamous perspective, if I ask you, for a lot of your audience they don’t even know who Jack Canfield is, but if I say to them Chicken Soup of the Soul, a lot of people will recognize that from the brand equity. But if we talk about who are the most, here’s a good example, Marcus Lemonis, he’s a mentor of mine, somebody I have a tremendous amount of respect for, a lot of people in the business community don’t know who he is but if I ask are you familiar with TL Television show on CNBC The Profit, “Oh yeah I’ve heard of that.” You really have to decide do you really want to focus on you in terms of like “Hey, I’m going to be the deal,” or do I want to create a legacy type brand. And again, you may never get there but the intention should be there that that’s where you really want to go because at the end you’re still probably going to be happy anyway. Micah: Yeah that makes sense and I think too you mentioned if somebody passes away the business goes with them but I have also run into some situations where somebody wanted to sell their business but it was like first name, last name.com, you know, what exactly are you selling? The brand equity can be really valuable, it’s interesting because there are people like Tony Robbins where he’s such a huge personality, I don’t know what his company name is, maybe it’s Tony Robbins Inc where I guess he could start a brand and it would grow but he is just so well-known and his personality is such a big part of the value that he brings. He’s the guy on the stage all the time, it’s not off another people. It is an interesting conversation. I think it is a decision people need to make early on. Obviously in the early stages do whatever works, get out there, get traction, but having some intention behind it so you know where you’re going and you’re not paying yourself into the corner can be really important as well. Eric: Right, again it goes back to when you’re talking membership site, based off your goal is to be the focus of the attention but if you’re looking to really grow a large community then it may benefit you to try to build a brand where other experts or strong alpha type people can join you and get behind the mission of the brand and not behind the name of that one individual because that way if you eventually want the freedom, part of my challenge for me personally is like I’m an extroverted introvert if you will. Meaning, I love the freedom to just kind of be behind the scenes and part of my struggle is consistently creating content putting myself out there because I don’t want to have to always be forced to continuously do it because as soon as you stop doing it typically the attention dies off and it’s hard to keep people engaged. So, that’s something you have to pack in, is what kind of lifestyle you want, are you willing to, you know, we have clients that have been on Doctor Oz, Good Morning America, some very high profile TV shows and they live a very strenuous lifestyle in order to keep up that pace to maintain the presence in their community. And so, again, you just have to decide, and that’s why I ask the client what’s the end in mind? What do you really want years from now so that I can see where you want to go and then help you architect that process for you, however we can help you. Micah: Got you. That’s a really good point because some of the people who do that personal branding they do end up doing a lot of work to maintain it and I like that you used the word attention there because I think in marketing or being well-known it is easy to lose people’s attention or someone can come up and take it or whatever, on the marketing side I think also as you’re delivering content trying to keep members, being able to keep their attention, staying in the light, staying relevant can be really valuable. It’s one of those intangibles, maybe you can call it that. Some membership site owners are looking at metrics and they’re looking at how much content they’re producing, I say some but I fall into this trap myself as well, and could probably do a better job at a lot of that, a lot of personal branding. I know that you’re an expert at helping people get exposure through major channels, I want to kind of make a turn here and ask a question because I feel this way and I’m guessing some people listening feel this way too, it’s how did you get to the place where you are a contributor on some of those biggest sites like Huffington Posts or Business.com or Entrepreneur or whatever. What was that like or how did you get there? Eric: Sure, so I want to go back quick and I want to answer the question second. One thing I want to make sure when you talk about the attention is a lot of people talk about we’re in this attention-driven economy and I just see that’s actually the case and I would say we’re transitioning and starting to die, for some folks listening or watching they may think it’s controversial but to me we’re transitioning into the engagement economy, meaning it’s one thing to get someone’s attention and you can get someone’s attention where it’s like here’s a good example like the Facebook and the bait and click. Now it’s beyond getting someone’s attention. It’s how do you engage that person, maintain that engagement and ultimately go back to relationships because someone was asking what’s the best tactics that you’re using, in a Facebook group someone was mentioning what’s the best tactic that you’re using to grow your business, what are the best hacks? My answer said I’m focusing on what I always focused on, which is being able to create value for people and then develop new relationships. If you just focus on those two over-arching concepts, then you’re playing the long game and you’re going to be successful in long-term developing relationships which is how, transitioning to your other question, I was able to be invited to contribute. One of the places that I kind of got my feet wet or I cut my teeth if you will is a news site called newswire.net. As it resulted with some personal relationship I had I was able to attend a wedding and it just happens that the person in charge of that organization was also at the wedding, introduction was made and here’s the mistake people make. Because ultimately when you’re first meeting anybody you don’t care. You don’t really say “I really care about your goals,” I’m focused on my stuff and you’re focused on your stuff and in a way you can really differentiate yourself, especially in this selfie-driven society, it’s what’s the focus back on you? What can I do to provide value to you? So when I met that person I was like I’d love to be able to contribute to a site but I didn’t do that, I wasn’t like “Can you help me get what I want” instead I focused on developing a relationship and over the course of a period of time, they actually invited me to contribute because I didn’t necessarily ask. As a result I continue to network and I use that platform as a stepping stone to provide value to other people and as a result I connect it to somebody who’s a financial planner, a well-known bestselling author and financial planner, and he happened to have contact with Ariana Huffington and he said “Let me put you on her radar” and he basically did a CC email and she said “We’d love to have your voice on Huffington Post” and that lead to that. Ultimately my body of work at Huffington Post lead to me connecting with some of the folks at business.com and I shared my content with them and they judged it and said “We would love your voice here” and then again that ultimately lead to developing a relationship with somebody over at Entrepreneur and they invited me to Entrepreneur. There was no agenda, it wasn’t like I want anything from you, it was just a sincere expression of my gratitude and I honestly feel like if I didn’t do that, because it wasn’t my intention to get something later, but I feel because I made that positive equity and relationship that that provided an ROI later or it saved those relationships. That’s what I call our strategic secret, is to focus on that. Micah: It’s so funny because talking about tactics or even strategic secret or whatever, it’s not complicated and I think people hear it or are aware of it help other people and don’t think of yourself first and whatnot. They’re simple but there’s not a lot of people who do it and I can say from knowing you a long time, every time I talk to you it’s “Hey how can I help you” and you’ve come to me multiple times saying “I’m doing this new thing, can we do it for you for free?” or I’ve got this idea or what you need help getting out there and marketing and whatnot, and it’s never once felt like you were looking for something in return or had any other reason to suggest it except that you genuinely want to help and it’s funny hearing that and how you built some of those relationships because it’s like “Oh yeah, I’ve experienced that from you myself” and it’s common sense, I think it is even common knowledge but it definitely is not common practice. You do run into a lot of people who might say like “oh, what can I do to help you” but it’s kind of like they’re itching to ask their next thing. It’s not a genuine help. Eric: Right. And you can tell when people are doing it genuinely and when people do it from an intention based stand point because let’s face it, even if you’re doing it with an intention of trying to develop a relationship with somebody because you do have some sort of an objective or thing that you want to have happen, one, that’s okay just make sure it’s a win-win and two, be smart about it. Focus on developing the right relationships with the right people because the right people eventually are going to say “Hey, what can I do for you?” If you go through a period of time and that person never reciprocates, that’s where I say you’re in an abusive relationship. Any relationship where you’re giving and giving and giving and you don’t ever get anything back in return, my wife and I consider that to be an abusive relationship. You have to decide if I’m going to continue pursue that if you don’t ever get something, and it doesn’t have to be physical, it doesn’t have to be financial, it can be emotional, like “Hey can you make an introduction to somebody else?” The thing that I would say is that we’re such what my wife likes to call a microwave society, we want to press the button 30 seconds and just spit out a funnel, we want 30 seconds and to spill out some check. And the real companies that really build brands do it over a course of years, going back to Tony Robbins, he started 40 years ago and had mentorship from people in this space that people see as an overnight success. 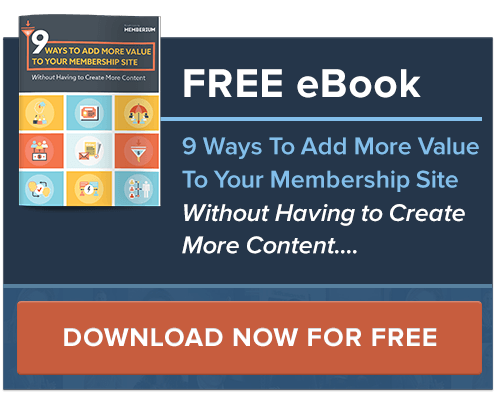 Micah: There’s a lot there to unpack but one of the things that I want to kind of focus in on is I think for membership site owners especially they need this. They need to connect to other people in their space because typically it’s not like they have gigantic ad or marketing budgets. Some of them do and if you do that’s fantastic, nothing against that. But just the ability to go and connect with people inside and outside of their space is how a lot of them build up to be successful. You may call it a glass roots effort but yeah, everything you’re saying about being able to work with those around you and typically if you come from that genuine authentic perspective, people aren’t going to say no, they’re not just going to brush you off if you’re really there to try to help them out. Like you said, people can tell when it’s not genuine so *inaudible* (25.54) and you do go and help out and I do feel that yeah, there are some abusive relationships out there, with our partner manager, I’ve told her a couple times, I’ve just said some people will ask for anything and they’ll keep asking and there’s a point where you got to say no, it’s not just help them out because for whatever reason they don’t have that filter of you know, maybe I’ve asked for much and I should give something back. But, by and large, most people, I think our society is built on a little bit of when I receive I know kind of intuitively I need to get back to keep things working, to keep things going. If it’s not happening you can distance yourself but I love that heart, especially for membership site owners because so often when I’m talking to them and let’s say they’re either struggling or they’re new and they’re asking how to get out there, sometimes I find myself giving answers that sound cliché but it’s how I really feel, it’s stupid simple things like maybe do a podcast or webinar, not that that’s a good tactic but because when you connect with people, with other experts that way, one, they’re really not going to say no if it’s something related to what they’re doing and you say “Hey, will you be a guest on my podcast” pretty much they’re going to say yes. And then from that, usually, not always but usually something is going to come of it, whether it’s immediately or down the road or at least you see that person at an event and “can you introduce me to so and so” and more often than not it just happens naturally. Sorry to go on a little rant there. Eric: No, I love what you said about reciprocity because I’m huge in the neuro marketing, I love understanding behavior psychology and what makes people tick and why do they make the decisions that they make, I come from that background of network marketing and the only way that I was going to survive was to be able to meet strangers, develop a relationship and see if they’re willing to start a part-time business and do it in a week’s timeframe, because I couldn’t sit there and wait months for that to happen. Right, cause we had to eat. As a result of that I’ve read I don’t know how many books, Micah, about different sorts of neuro psychology and tests and why things work in the way they do, and so one of those key factors which is written in a couple of the bestselling books by Doctor Robert Cialdini is reciprocity. Here’s a perfect example. When we first connected I had a need. I was looking and researching a membership site software. We’re huge Infusionsoft fans, shout out to Infusionsoft, so we had Infusionsoft and I wanted to build a membership site community and I was researching what would be a good solution. I had reached out for some different solutions and I wasn’t enchanted with the communication that I got from some organizations and as a result of my frustration I was kind of like I don’t know what I’m going to do, maybe I’m just going to have to postpone this whole think because I really wanted to have not a short-term solution but something long-term that would really stand the test of time. I was a part of Ryan Dice, he had a community program for building membership sites and they had like a weekly conference call and I don’t even know Micah if you knew this but that’s how I found out about Memberium before it was even called Memberium and I was like wait a minute, if Ryan Dice is using that for digital marketer, I know it’s got to be good. And I harassed him to be like “Hey, how do I get a hold of this?” and they were like it’s private nobody can get it, and then again I focused on building relationships and networks and connected with David Bullock who is an unbelievable developer, amazing human being, someone you’re very fortunate to have as a partner, I trust his judgement when it comes to so many things in the tech space but that’s how I found out about you guys. You guys were basically like “Hey, yeah we will help you out” and I was like wow, you guys are really communicative, you’re really helpful and I was really impressed and so that’s what I think lead to the genesis of me reviewing you, several years ago, which we both looked a lot different back then. Like you wouldn’t know that we were professional marketers and so that reciprocity like you’ve given to me, I’ve felt like I wanted to give back to you and then you’ve given back and I’m wanting to give back and that’s what a good relationship should be where it’s symbiotic and win-win and hope everybody grows together because famous shark tank Mr. Wonderful once said that you cannot succeed and grow in a business without partnerships. Micah: I’m glad that you brought up Dave because we don’t bring him up enough but he is one of those guys who is an amazing programmer just like an amazing not just programmer, levels above that, architect, strategists, keeps things running. And I’ve dealt with many good programmers, this isn’t my first piece of software and Dave he’s got all that better than anyone I’ve known and he is so communicative, like you said, he’s not like off in his little cave and doesn’t want to talk to anybody, he can switch right from coding and developing something to answering a question, being on Facebook, just before this I was on an office hours call where he is talking people through his strategy, patiently talking through people who are not technically-savy, normally programmers that can frustrate them. It has helped. Our business is built on simple little things just like you’re talking about where we just help somebody out and then help the next person out and luckily I think we’re really blessed that our market, our customers typically know a lot of our other customers and are not afraid to talk about it so we are fortunate that way but it is the simple things typically. You and I go back and forth, it’s funny because we have done different kind of business things together but every time I see you it’s not like there’s a business contact, there is Erock, there’s my friend, it’s a good relationship. Eric: Yeah and going back to Dave I want to make sure that everyone that is listening and watching this is that David and you as well, you guys have this integrity. I remember when I was so frustrated way back years ago with the lack of communication, I had reached out to different membership solutions back in the day when I was doing my research and I tried three different ways to connect with the people there and I didn’t hear back from them. I was like if I can’t get you to sell me your product, what kind of help and support am I going to get if I pay for it, right? Because you don’t even have my money yet. What I love is when I first connected with Dave you guys were so helpful and I was like look man, you guys should say something about this lack of communication that was going on and Dave was like “Hey, I’m going to take the high road, I’m just going to focus on what we do and doing the right thing” and I was like that’s the kind of people that I want to roll with and I’m going to trust my business because in essence I’m not looking at Memberium as like a piece of technology, I’m looking at it as a brand partner in terms of this is my partnership to develop relationships with my community members and I’m not going to entrust that to a company that is not going to have the same core, the same ethics and the same motivation that I have. That’s why I believed in your guys’ system and even though it wasn’t even called Memberium, I don’t even know how you guys were doing financially but I just knew from the relationship and knowing the integrity that you and David had that I could trust my business that you would grow it into a full blown enterprise solution which is what you guys have done and we’ve been ecstatic because it’s the last thing we want to have in our business when we’re growing our community is for people to have a bad user experience in the membership area and that’s to have a bad architecture structure and support that you got so I’m grateful for you Micah. Micah: I appreciate it man and yeah, it’s funny you bring up what we were making at the time and it’s like we were making nothing at the time but that’s how you have to start, you have to do the work before stuff comes about. I want to kind of pivot this a little bit and talk about specifically your company BizFamous, what you’re doing today, what kind of service do you offer and who do you offer them to, and we’re kind of running towards the end here but I want to get a little bit more specific about the stuff that you do. I’m familiar with, I shouldn’t say that, I’m somewhat familiar with it and we’ve talked about a lot of it but for people listening, because we’ve talked about the high level of it, yeah you need to do this, you need to do that, well how? How do you do that for people? Eric: Okay, great. Again, I want to provide as much value as I can and it’s funny because people will criticize me that I don’t talk enough about myself or being salesy but I believe if you provide value the right people will reach out to you and will want to work with you. So, kind of our system, number one you need, I want to make sure I go through this quickly because I think you have a very educated audience and I don’t want to disrespect their intelligence but obviously you have to know your avatar, you need to have done your keyword research. I come from a background of SEO in terms of knowing what people are looking for online so you need to find where those people are hanging out, where the communities are at, what’s their search intent, what problems are they going to solve and I’m assuming that’s a part of membership.coach and they can get all that information there. But the key is that you need to be creating consistent content, you have done your keyword research, Quora is a great website for getting questions and answers, figuring out what’s popular, what kind of engagement is, and just take those questions and basically ask them of yourself and then answer them to provide the value. Whether it’s for your membership area, in terms of offering support to community, or if you’re trying to externally find new prospects for your membership site, just find out what the questions are and then be the one that can answer their questions and then just make sure you do it in an authentic way that can be relatable and one of the biggest mistakes that I’ve made, that I see a lot of people make, is that they’re not willing to be divisive or be controversial and even I struggle with that sometimes because that’s a hard thing to commit to. But if you really want to attract the people that your ideal membership community is, on some level you almost kind of have to offend the other site. Where it’s like “Hey, this is what I really believe in, here’s my core values and because there are so many places that people can get information, people are ultimately going to pick people that they like, know and trust.” Would you agree with that Micah? Eric: And you’d be totally wrong. Eric: So it’s a trick question. Yes people still need to like, know and trust you but this is my thing. I’ve never heard anybody else say this, if somebody out there is saying this just give me credit, *inaudible* 37:45 know, like trust so Micah, how many real estate agents do you know right now that you like and trust? Eric: Okay how many Infusionsoft partners do you like, know and trust? Micah: I don’t know, 20, 50. Eric: So how do you decide? I need help who are you referring to in a tie breaker’s respect. That’s why we’re big proponents of third party social proof that you can go out and get if you network with those right relationships and then you promote the third party things talking about business. It’s such a big thing, that’s why we developed a software, it’s called LeadFamous and we’re going to be really *inaudible* 38:33 probably in Q2, Q3 sometime this year, but basically a part of our process is you want to put yourself in the position to be featured as an expert on other sites. If you come visit our site you’re not going to see a whole bunch of blog posts, you’re not going to see a whole bunch of information about stuff there, I want to syndicate and publish our content on these other sites, like Entrepreneur and then hopefully find other people who will talk about our business on some of these sites and then we promote that content. In a selfie world, anybody can go I’m Eirc I’m awesome, my name is Erock I can help you grow your business, 10x overnight, but there’s so many people doing that. Very few people are getting that third party of “Hey I saw somebody saying great things about your business and I want to do business with you” because I have enough social proof that validates “Hey I can trust you and I respect your business”. Eric: Exactly. Because the more people, we live in this what my wife likes to call infobesse society, we’re getting fat on information. Some of your listeners may say “oh My God don’t say that because I’m running a membership site, I’m offering information” and that’s fine, that’s only going to continue to grow, it’s only going to get worse. The key is how do you figure out how to cut through the noise and not just get someone’s attention but develop and engage with them and turn that into a relationship. So if you visit our site through our email and we invite you in, it’s not even an open community yet, we’re still building it out and launching it, but you get the email to come in and you go to the page that says right there your image has a custom name on the front page of Forbes on our site, you’re like wow this is kind of cool, maybe I should join. So again, if you focus on relationships, creating experiences, finding other people who will talk real about you and hopefully promote you. Ultimately you want brand ambassadors. Every business, it kills me, we consulted with a major, maybe not major but a high level social media software company and they were like hey we want to get funding we want to grow and this product solution is unbelievably amazing, it’s like the best solution in my opinion on the market place. But how do we grow? I said we made a plan, bring brand ambassadors in and brand ambassadors can all contribute their content to their website so instead of you going and hiring seven writers for your company to churn up content, create a platform that your community of customers can showcase their ability to be professional social media managers to talk about how great this tool is to make their life easier and create a better result and build this community and we can completely kind of put this program together and we just started to initiate the process and they said we’re going to stop, we’re not sure if this is going to be a good investment. And I’m like okay but ultimately, I really feel like one of the things a membership owner should do, this applies to any small business owner but especially membership site owners, is that don’t always try to be the one creating the content. If you really want to build engagement give your community the opportunity to share their wisdom, to share their experiences, to share their thoughts because it provides a different perspective and it also shows that you have this confidence in yourself that you don’t always have to be the deal but that you can share the spotlight with other people and that only makes you look better. It’s only going to create more engagement and that person, what are they going to do? They’re going to be like “Hey, I just contributed this content to the membership site” they’re going to go tell everybody and try to get them to come into their membership community. What do I do? I go and I promote my Entrepreneur articles all the time, as a matter of fact, I’ve been so busy I did one two weeks ago, I didn’t even email my lists to say go read my article. But I go and I don’t talk about myself in my articles, what do I do? I featured four different Facebook ad experts who have spent over a billion ads in Facebook ads because of all the stuff that’s going on in Facebook right now and shared their wisdom and then I promote that. And I say “Hey, this is what we’re talking about” and then what do those folks do? They’re going to promote to their communities that they’re doing it and by default I’m going to be able to get some of that attention and some of those people are going to reach out to me and hopefully turn to the business but if not I don’t care. I’m still going to have the things that we do that provide value but if you’re Membership or a website owner watching or hearing this, focus if you really want to be a differentiator, focus on how you can share some of your spotlight with your community and feature them as leaders and experts and if you build up that process then you can ultimately bring in a group of leadership that can help you really grow your community. Micah: I can definitely tell you’re passionate about it and it kind of ties it all together, like the social proof with the content creation with the positioning, it’s perfect place to put a wrap on this a little bit. Thank you so much for letting me ask you kind of weird, abstract questions, I thought your answers are genius. How do people connect with you if they want to connect and talk? Eric: Great question. Here’s what I’m going to do, I haven’t done this yet, it’s just in my mind right now, but one of the things that we have is a technology platform for text messaging. So if someone wants to connect with us I don’t know what will it be, this is what I’ll do, we’re working on a course, membership course, we’re putting together how do you get the attention of media, how do you get attention of journalists and how do you develop those relationships? So we’re in the process of generating that content so what I’ll do is I’ll give them access to that, if that’s okay with you, where they can get access to one of our modules where we teach in like 15 minutes, short, and if they want to text the work Memberium21, you text that into the code 21777, we will set that up so you can get that deliverable and if for any reason you’re listening to this and you’re not in the United States or you’re in another county then maybe in the show notes we can put a link down there as well, but thanks for the invitation Micah, hope that’s okay with you. Micah: That’s perfect. We’ll put some stuff under the video so if you’re watching go under the video, if you’re listening to our podcast go to our site or you can just text and correct me if I’m wrong here, Memberium21 to 21777. Micah: Perfect. Of course, you can always look up BizFamous, you can look up Eric Christopher, I know him as Erock, he’s a good friend of mine. Erock, again, I really appreciate it, thanks so much for coming on! Eric: Dude, I’m grateful for you man, I’m excited, thank you for having and inviting me to your show, my hope out of this and my intention is that your listeners and watchers get a whole lot of value out of it. Here’s my biggest frustration in the membership world, is you take the time and effort and energy to help you provide value and then people don’t go and take action and execute it so if you’re listening and you’ve found value in this and it helped you grow your membership community, just reach out on social media and let us know you’re getting that feedback, because there’s nothing more gratifying, even more than money, is the gratification of making an impact on someone else’s life as a result of being able to share stuff that other people have thought me. Micah: That’s beautiful man, thank you!